This website was produced as part of the Consolidated Rail Corporation's (Conrail's) Double-stack Clearance Project involving improvements to railroad infrastructure on Conrail's National Docks Secondary Line in Jersey City, Hudson County, New Jersey. Specifically, the website highlights the historical, architectural, and engineering significance of the Bergen Hill Tunnel and the Waldo Yard Tunnel, two significant structures in the history of railroading in New Jersey. Using federal funds provided by the Federal Highway Administration and administered through the New Jersey Department of Transportation, Conrail increased overhead clearances inside the Bergen Hill Tunnel and the Waldo Yard Tunnel to accommodate larger shipping containers stacked one on top of the other. The improvements are part of a larger effort to improve freight movements throughout the region. Called the Double-stack Clearance Project, the job involved increasing the tunnel heights from 19 feet, 6 inches to the industry inter-model standard of 20 feet, 9 inches. This involved scraping the top of the Bergen Hill Tunnel to remove excess rock and day-lighting a portion of the Waldo Yard Tunnel. Related improvements included the rehabilitation and realignment of existing tracks, maintenance cleaning of existing ditches to improve drainage, and the installation of catch basins, drain pipes, and a pumping station to collect and discharge runoff. Because both the Bergen Hill Tunnel and the Waldo Yard Tunnel are historically significant and eligible for listing in the National Register of Historic Places, the clearance project included measures to preserve and restore portions of the tunnels, including the two deteriorated portals of the Bergen Hill Tunnel, and documentation of their history for circulation among the public. This website was prepared by Richard Grubb & Associates, cultural resources consultants for Jacobs Engineering Group and Conrail on the Double-stack Clearance Project. The website was created pursuant to a Memorandum of Agreement (MOA) between the Federal Highway Administration and the New Jersey State Historic Preservation Officer, dated May 29, 2009 to mitigate adverse effects on the two National Register-eligible historic properties. 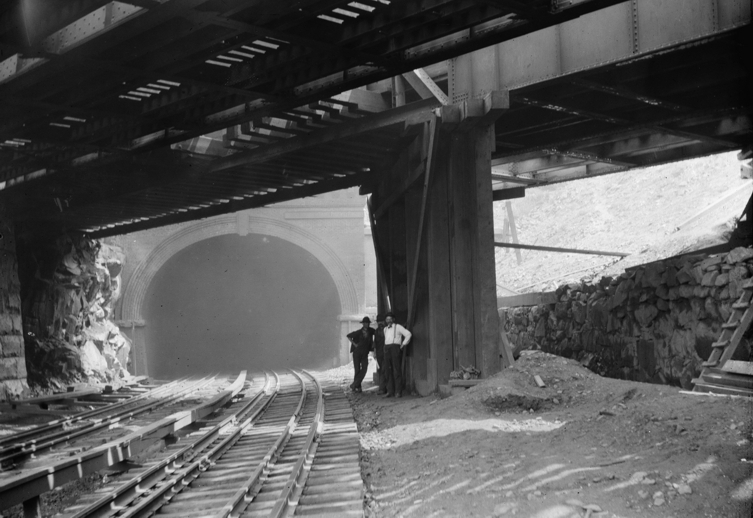 West Portal, Bergen Hill Tunnel, August 13, 1906. Workers engaged in building the overhead DL&WRR bridge pose for the camera next to the Erie RR's double-track main line with the original brick portal of the Bergen Hill Tunnel in the background (Seely 1977: Attachment HAER NJ-22).